To respect the others’ point of view and try to understand it. This applies whether it’s warring nations, difficult negotiations in business or designing something for other people to use. You know when a door has a label that says push (or pull) when it should just be obvious? That bad design is referred to as a “Norman door”. Don Norman is usabilty. And it turns out he is sustainability too. Dr Donald Norman has for many years advocated user centred design. His 1988 book The Design of Everyday Things has been top of the reading list for both design and computing students for nearly three decades. Several other books include Living with Complexity, Emotional Design and The Invisible Computer. The question for this conversation, is how can we apply the learnings from Norman’s work to the design of systems for sustainability? A physical affordance is not what matters, what matters what it says to who is looking at it. How could we make people more aware of the source of their electricity? It’s not an easy problem, but its one we should be much more concerned about. And how do we do that without getting in the way? It would be good to get a little bit in the way because we would like people to use these things less, some habits need changing. It’s hard, really hard to change behaviour. We are wasting most of the stuff, wasting things that is not doing nobody any good. One thing that bothers me about the sustainability movement is that people look for easy answers. In the design world, its a standard thing that people ask your design class to come up with things that will save energy, so they come up with simple answers – we’ll use wood instead of some manufactured stuff, and we’ll have a meter that shows you how much hot water you’re using when you take a shower – and it’s all rather silly in my opinion. I want to work where I have the biggest impact, but the amount of water we waste in the household is trivial…in the US most of the water is used in industry and agriculture and evaporates before it reaches its target. I want to do things that have the maximum impact, it makes people feel good to make sure you turn the lights off when you leave the room – and that’s good and I don’t want to say we shouldn’t – but when you look at the total amount of energy in the country, that’s just a small percentage. Wicked problems, by definition – they’re wicked. Its often hard to define the problem, it’s hard to know when you’re getting an answer. But most of these (sustainability) problems are like that. You’re not going to find a single thing to solve a wicked problem – it has to be a concerted effort. We have to change the whole nature of business so they realise that they have an obligation. Business has an obligation to society, to where it lives. We once chose to believe that, but modern business schools have taught the importance of profit, and quarterly profit and benefit to the stockholders – but I’m more concerned about benefit to the world, to humanity. We have to figure out how they can do that in a responsible way. (on systems and complex problems) We have to start thinking big. Question, step back and ask the biggest problem. The scale has meant technology has had implications we couldn’t predict. I decided I didn’t want the military money, and I stopped taking it. So yes, there are many things I would not do. I will not worth with cigarettes, I will not work with weapons. These things we consider evil and the things we consider non-evil, the problem is there’s very seldom a sharp line between the two…as the example of lethal weapons highlights…students ought to grapple with that and think about it. We owe it to students to cause them to think these issues through. That doesn’t mean we should tell them what they should think. But we should teach them how to think, how to examine the different sides, and how to determine what their response is. One thing that annoys me is what we call human error. 95% or so of accidents are blamed on human error, on people. Nonsense. If it were 5% I would believe it, but when it’s 95% it means you’re not designing things that are appropriate for people. We need to think of accidents as a rope of many strands, it’s the last strand that breaks that gets the blame, and usually that’s the person with their hands on the rope. (can we think about extinctions and climate change as human error) That’s why the systems approach is so necessary for accidents and especially for sustainability. We look at the last thread that breaks – and say ‘I can reduce the amount of water you take while taking a shower’, or wood instead of metal or whatever – and that’s the easy answer and it might not be at all relevant, you have to ask, what does the system look like? The technologist’s solution is technology – we’ll make cars that can drive themselves. But is technology the solution to all our ailments? No, and sometimes technology is the cause of those ailments, so it will take a mix. I’m an activist, just not a jumping up and down activist. I certainly believe in the principles of sustainability, and I’m trying slowly to cause these changes to come about. Challenges. When I look around the world it’s frightening. Global warming – look at how difficult it has been to convince people that it’s a real phenomenon and maybe do something about it if we start now. Peace for that matter – look at all the warring factions in different parts of the world. (what can we take from his writings, Design of Everyday Things and so on, to apply to these bigger sustainability problems?) Empathy, to understand the other point of view. You have to design for other people, the consideration of other people, and other people are not stupid. If you have two groups fighting and disagreeing, quite often each of them are correct, but it’s from their own narrow point of view. 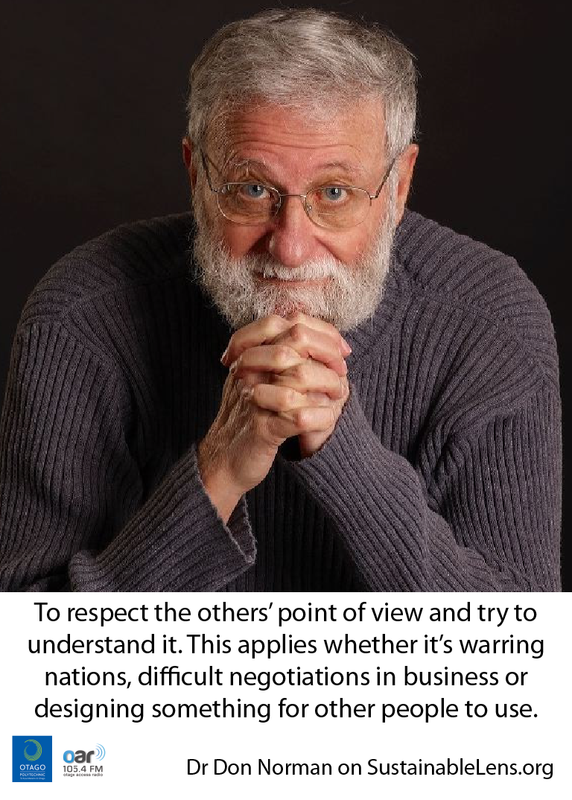 You can’t come to some sort of agreement unless you understand the other person’s point of view…doesn’t mean you have to agree with it, but it does mean you have to understand why they are so vehement. And that’s the only way to come to a resolution. To respect the others’ point of view and try to understand it. This applies whether its warring nations, difficult negotiations in business or designing something for other people to use. Whenever we do things, we should try to understand the other people, take into account not how people ought to behave – it’s so simple to give a lecture ‘this is what you should do’ – no, go and observe them, talk with them and understand them. Take a systems point of view, don’t look at one simple thing, but look at all the interacting parts, life is complex and that means our solutions will be complex ones.